The AR 15 system is the most popular firearm in the United States. There are hundreds of manufacturers pumping out rifles and the American people are buying them up left and right. Because of their popularity and easy to customize nature, you can change everything. This includes the trigger. The trigger is a critical part of the weapon and upgrading it is easy. Since the AR 15 is used in so many roles the differences in triggers help suit the rifle for the role. So strap in and let’s get educated on what trigger options you have. Before we get deep into the different trigger systems we should look at the difference between standard and drop in triggers. Regardless of the type of trigger, you choose it will come in one of two different categories. Standard fire controls groups are made up of several different parts. 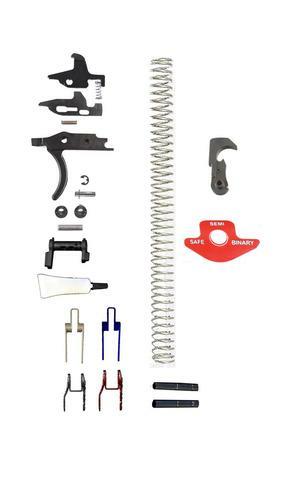 These are the hammer, hammer spring, trigger, trigger spring, disconnector, and disconnector spring. 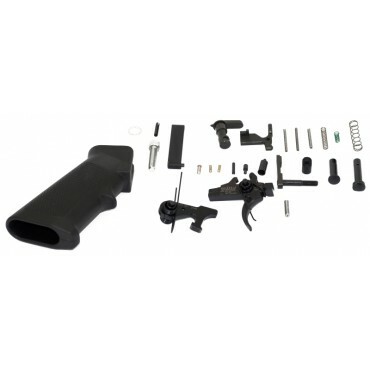 As a builder, you’ll have to assemble these parts and put them into your lower receiver via two pins. The advantages of a standard trigger group is price and availability. Most trigger systems are standard systems when it comes to mil-spec triggers. Several companies also produce match grade triggers in the standard variation. These triggers are much cheaper than drop in units. If something does break with one of these triggers it is easier to buy and install a new part. Drop in units are entirely self-contained fire control groups. Installation is much simpler with these units. The owner simply places them in the rifle and secures them with two pins. Drop in units are often very high-end triggers designed for certain tasks. These systems can often have features like adjustable pull weight, and improved trigger pull. 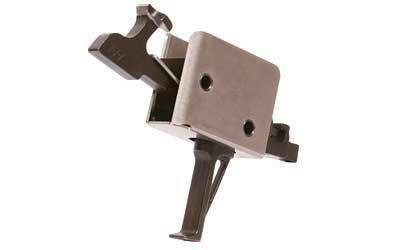 If you are looking for a match grade trigger you’ll find a much greater selection of drop in units. These units are often much more expensive than standard triggers but are generally better built. The biggest differences between AR triggers is drop in and standard, and single stage or two stage. The decision between a two stage trigger or a single stage trigger is user preference. They can come in standard or drop in variants. Single stage is the most common trigger out there. 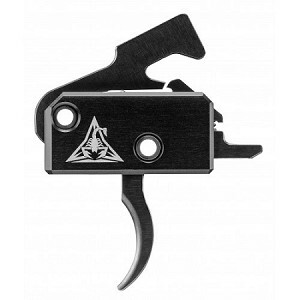 Mil-spec AR triggers are single stage triggers, the triggers in handguns are single stage triggers, and most stock triggers in any gun are single stage. Single stage means the trigger only has one range of motion. From the beginning of the trigger pull to the time the trigger fires the weapon, it is one continuous motion. Single stage triggers are the simpler option. They are usually the most affordable option as well. They are easier to adjust and often easier to install. Experienced shooters are often used to single stage triggers already. This reduces training time needed to become proficient with the trigger system. Single stage triggers can be remarkably lightweight. So much so that in hunting or tactical situations they can be too light. This light triggers are more likely to experience a negligent discharge. Two stage triggers are generally considered more refined that single stage triggers. Two stage triggers are suited for a wide variety of tasks. They can do anything a single stage trigger can do. The two stages are very distinct. The first stage is light and slightly long. Here you are taking up slack on the trigger. Once the slack is taken up you meet the wall. The wall is a stiffer section of the trigger pull and is the second stage. Pulling past the wall will result in the gun firing. This wall can be very light, but it is still noticeable. When fired fast the effects of a two stage trigger are not necessarily felt. The trigger feels substandard when compared to a match grade single stage trigger when rapid firing. In slow fire the increased trigger control is a serious advantage. The short break at the trigger's wall reduces sympathetic movement from the hand. Binary triggers are quite new in the AR 15 world. There are currently three companies producing binary triggers. A binary trigger fires once the trigger is pulled and once when it is released. This results in two shots fired. This is completely legal and is not an NFA item. This two-shot system is made by Franklin Armory, Fostech, and Digital Trigger Technologies. This technology is rather new and it’s largely used for recreational purposes. One of the newest triggers on the market is the Digi trigger by Digital Trigger Technologies. As far as I know this is the only digital trigger system on the AR 15 market. The digi trigger is a binary trigger with multiple modes. Although it is digital you can still use your firearm in a mechanical way. The system reduces trigger pull weight to 1 pound and allows a binary function. It’s certainly the highest tech trigger I’ve ever seen. There are tons of AR 15 triggers on the market and making the choice for your rifle is a personal one. Most guns are perfectly square with a mil spec trigger. However, if you want something a little different then you have a lot of choices.